(Nanowerk News) Wearable power sources for wearable electronics are limited by the size of garments. 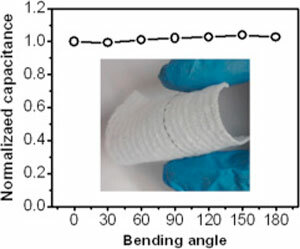 With that in mind, researchers at Case Western Reserve University have developed flexible wire-shaped microsupercapacitors that can be woven into a jacket, shirt or dress (Energy Storage Materials, "Flexible and wearable wire-shaped microsupercapacitors based on highly aligned titania and carbon nanotubes"). Dai's lab is in the process of weaving the wire-like capacitors into fabric and integrating them with a wearable device.